Okay. I admit it. I don’t typically care for young adult paranormal books. They’re usually either too silly and juvenile, or they’re too freaky and scary (and I’m a nighttime scaredy-cat). But The Haunting of Sunshine Girl successfully hits that sweet, just-right, Goldilocks spot of perfect creepiness. Sunshine Griffith moves with her mother from Austin to Ridgemont, WA. A big adjustment to be sure, but one made much worse by moving into a home that already seems to be occupied by the ghost of a 10 year-old girl. Sunshine’s mother doesn’t believe her, becoming distant and straining their normally close relationship. 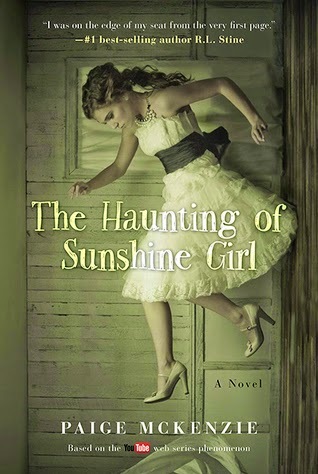 As she investigates and attempts to prove the ghost’s existence, Sunshine discovers that much more is happening than just a simple haunting. The authors made a bold choice in the close, healthy relationship between Sunshine and her mother. So much of Young Adult literature is saturated with parents that are apathetic, incompetent, absent, abusive, manipulative, or some combination. But not here. Sunshine and her mother have the kind of open, communicative relationship that most of us would like to have. When Sunshine’s mother begins to work longer and longer hours and withdraw from the relationship, it is a clear sign that something is desperately wrong. I was drawn into the story by Sunshine and Nolan’s research into the ghostly phenomenon. (And, by the way, everyone should have a friend like Nolan. Seriously.) Their reactions to the information they learn and the things that happen around them are believable, which added immediacy and credibility to the story. I don’t want to give away too much, but I am definitely looking forward to a sequel. A light, fun, yet spooky read. Great review! This book sounds so awesome, I like creepy stories!